A few days after I took delivery of the Monitor 40.2, the third version of Harbeth’s flagship loudspeaker, a close friend fell by for a listen. He’s a Los Angeles studio musician (a violinist who’s played many high-profile film scores, often serving as concert master), who is also a long-time audiophile, a member of my informal listening group, and an extremely discerning listener. Within about a minute or two of listening, he asked, “Aren’t you tempted?” He had no idea. I had a sinking feeling from the moment the speakers were delivered—they were already well broken-in—and I started listening that it was going to be extremely difficult to part with them. Several months later I gave into temptation and bought the review pair. This is the sort of admission we reviewers typically reserve for the climax of a highly enthusiastic review, the coup de grace that drives home the full measure of our enthusiasm for those special products we elect to buy for ourselves. But under the circumstances I thought it might be prudent to declare it from the outset, because this is going to be a rave review. In the grand scheme of things, one man’s opinion doesn’t matter much more than the next’s. But if actions really do speak louder than words, then in the strictly personal sense my action is a pretty large statement in view of my history, because for the last quarter-century not only have my reference speakers been Quad ESLs, beginning with the 63, then the 988, and since 2005, the 2805 (in my view still the finest speaker Quad has ever made, though I also have a fully restored vintage pair of original Quads), Quads have also been the only speakers during this time that I’ve purchased for personal use as my main speakers—until now. In order to keep this piece within a manageable length, I’m going to skip the usual detailed product description and design history because much of this is covered in the accompanying interview with Alan Shaw, the owner of Harbeth and the designer of its products; and for a fuller discussion of his methods, his philosophy, and his roots in the great tradition of loudspeaker research and development pioneered by the British Broadcasting Corporation, I refer you to my review last year of Harbeth’s SuperHL5plus at theabsolutesound.com and to my articles on the BBC Monitor and Harbeth in TAS’s Illustrated History of High-End Audio, Volume 1: Loudspeakers. The 40.2’s remarkably flat impedance curve of 6–8 ohms presents a benign load that makes for excellent results with all good quality or better amplifiers. As it happened, the evaluation period overlapped with the reviews of several amplifiers, the comparing and contrasting of which the Harbeths made child’s play of, sonic differences instantly audible. They can also handle prodigious amounts of power without stress or strain yet will yield eminently satisfying results with amplifiers rated as low as 35 watts per channel. Stand-mounting is required (17" high or enough to place the tweeters more or less at ear level), as is placement away from surfaces, while on or near on-axis listening is strongly recommended for accuracy of frequency response and precision of imaging, both of which will be compromised if you aim them straight ahead. Inspired by the BBC, Shaw has spent over three decades researching how to make loudspeakers perform optimally in real-world domestic settings, and all of that knowledge has gone into this speaker. Shaw himself regards the SuperHL5plus as his statement of what a domestic loudspeaker should be, but I think this new Monitor 40.2 is his masterpiece. Although designed as a studio monitor for the BBC—a professional version is available with a utilitarian finish—the sizes of the BBC’s control rooms and studios are more or less equivalent to the vast majority of domestic rooms, so the speaker is as much at home at home as it is in the studio (see the accompanying interview for more on this). Despite full, deep, and powerful bass response, the Monitor 40.2, like other Harbeths, is easier to place for optimal performance in ordinary rooms than almost any other full-range dynamic speakers in my experience. This may be one reason why they excel at trade shows. I’ve heard them several times at Newport, where most exhibitions do not sound particularly good, yet Harbeth’s rooms are always, as I’ve written several times, oases of musical naturalness and relaxation. 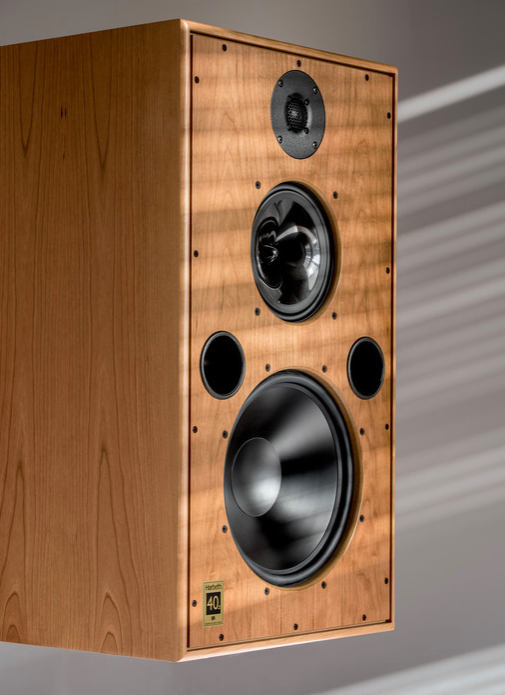 Let’s start with the midrange—that’s where everyone seems to start when it comes to Harbeth speakers. Trouble is, what’s left to be said? How many variations can you ring upon “beautiful,” “luscious,” “ravishing,” “gorgeous,” “drop-dead gorgeous”? Let me approach it a different way. The Monitor 40.2 is flat throughout the entire midrange, from the lower midrange/upper bass all the way through the upper midrange and into the presence region. This translates into an all but peerless tonal neutrality and naturalness that was evident from the moment the speakers were set up and playing. All Harbeths shine on voices, this one such that you feel you’re hearing voices the way they really sound in reality. One of my toughest acid tests is the Anonymous Four, four female singers who do their best to sound indistinguishable from one another (and whom I’ve heard in concert several times, most recently on their farewell tour a couple of weeks before I took delivery of the Harbeths). This is, of course, impossible, but it does take a speaker of rare resolution to allow you distinguish among them as discerningly as the 40.2 does, literally sailing through the challenge. The same applies to instruments, which are reproduced truthfully in all their range, variety, and individuality of timbre and character. Many years ago James Levine recorded a Strauss program for DG with the Metropolitan Opera Orchestra, an ensemble that for sheer opulence of instrumental color was almost without equal at the time, featuring Death and Transfiguration and Don Quixote. Being multi-miked, the recording doesn’t present the illusion of hearing an orchestra in a concert hall. However, I’ve been reliably informed that a great many musicians are very fond of it because the instruments actually sound like real instruments in timbre and character. I’ve never heard it reproduced with quite the richness and variety that the Monitor 40.2 reveals, not even by my beloved Quads, with that elusive impression of listening back through the chain to the source itself. Perceived levels of coloration and distortion are astonishingly low on this speaker, easily rivaling those of my Quads. Two examples, both of them vocals: The Alamo soundtrack features two speeches by John Wayne taken directly from the movie’s soundtrack. The recording was made outdoors, so there are no room acoustics as such to deal with, and it seems to have been processed with absolutely minimal control-room processing (I doubt there was any at all—these were pre-Dolby days). It will tell you a great deal about materials colorations, box resonances, and tonal anomalies. For all Wayne’s bravado and physical size, his voice is surprisingly light and pitched rather higher than you might think, despite some gravel from years of drink and tobacco. There should be no false underlining to it, and no bogus nasality apart from a mild vestigial nasality (which never approaches honkiness) in the voice itself.